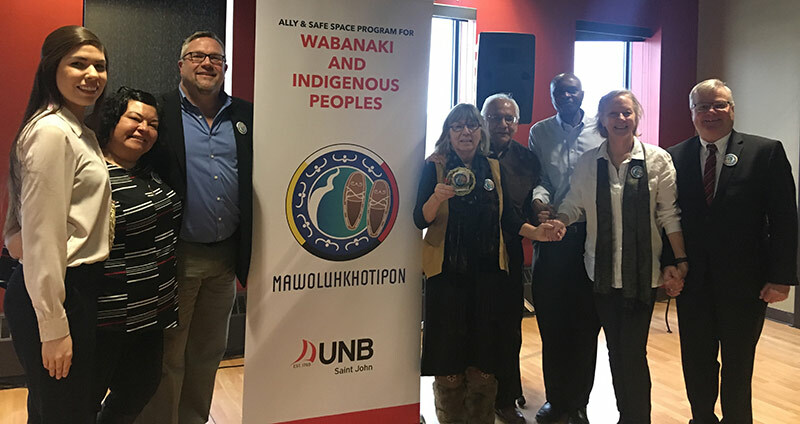 Mawoluhkhotipon: Ally & Safe Space Program for Wabanaki and Indigenous Peoples was officially launched on Monday on the UNB Saint John campus. The Ally & Safe Space Program is an innovative project intended to support a campus community that affirms, welcomes and supports Indigenous peoples who work, study and visit UNB Saint John. “This program was developed in close collaboration between members of the campus community and Elders and Indigenous community members,” said Dan Nagel with the department of nursing and health sciences. Nagel and Catherine Hamilton, also from the department of nursing and health sciences, worked with third-year nursing students to create and refine the educational components of the program. A name gifted by the UNB Council of Elders, Mawoluhkhotipon means “togetherness in space” and represents the goals of the Ally & Safe Space Program to enhance cultural awareness of Indigenous peoples. The program is one of many initiatives intended to support the mandate of UNB’s Truth and Reconciliation Strategic Action Plan. The official launch was followed by a Blanket Exercise which provides a participatory learning experience and understanding of colonialism in Canada. Allyship training sessions will be offered through the Winter and Spring; dates and times will be advertised on campus in the near future. For further information, please contact allyprogram@unb.ca.